Bobbing for apples is one of the most popular Halloween games in Ireland. In China, they place food and water before photographs of their deceased relatives. They also make bonfires and light lanterns to guide the spirits on their path back to Earth. In Italy, they bake cakes in the shape of beans called Fave dei Morti or Beans of the Dead. 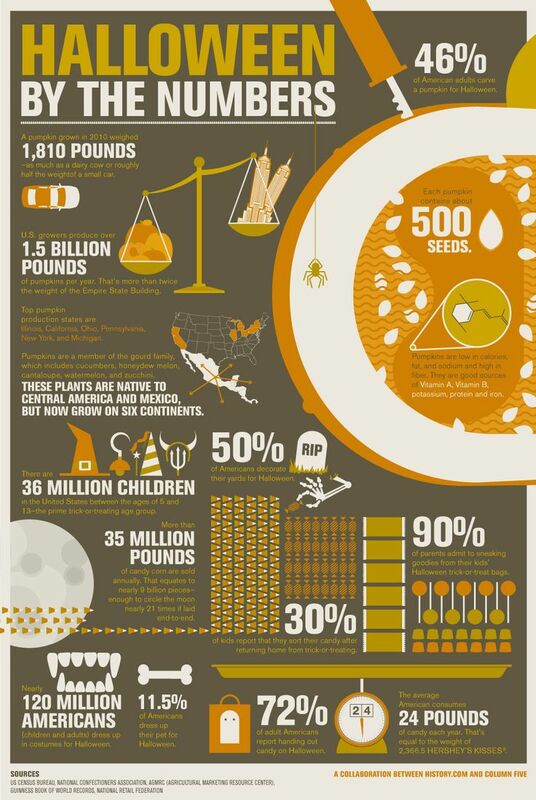 In 2009, the total production of pumpkins by major pumpkin-producing states was 931 million pounds. Illinois is the largest producer by far, making 429 million pounds of pumpkins annually. The next full moon on Halloween night will be on October 31, 2020. Every year, 24.3 pounds of candy are consumed by Americans per capita. Halloween originally started as a Celtic feast called Samhain, signaling the end of the summer harvest and preparing for Thanksgiving and the winter. For the Samhain, the Celts wore costumes typically consisting of animal heads and skins. Today, costumes are obviously still worn, but more commonly of monsters, zombies or other creepy characters. In the Middle Ages, people dressed as ghosts and other malevolent creatures. They would perform in exchange for food and drink. This is what became what we know of modern day tick-or-treating. The correct spelling of Halloween is actually Hallowe'en. Some other names include All Hallow's Eve, The Feast of the Dead, Haloween, and El Dia de los Muertos. 86% of Americans decorate their homes in celebration of Halloween. 90% of parents admit to sneaking goodies from their kids' Halloween candy bags. Nearly 120 million Americans, both adults and children, dress up in costumes for Halloween. Even more, 11.5% of Americans dress up their pet for Halloween. 46% of American adults carve a pumpkin for Halloween.